The 120-ft support truss for the conveyor gallery that transports refuse to a storage bin at the Buchanan Mine needed to be repaired. The U.S. coal industry has endured a very difficult period during the past few years. Capital for new projects has been limited and major maintenance has been postponed. Meanwhile, the infrastructure ages. Many structures, such as conveyor trusses, have been exposed to various elements over the years, including coal, water and the environment, all which cause corrosion and deterioration. In many instances, these types of structures have experienced other types of damage as well from mobile equipment or improper maintenance. It is important that these structures are inspected and monitored regularly to ensure they are functioning in a safe manner. When a structure is determined to be in need of serious repair, it can be difficult, but not impossible, to perform the repairs while not negatively impacting the operation of the mine. 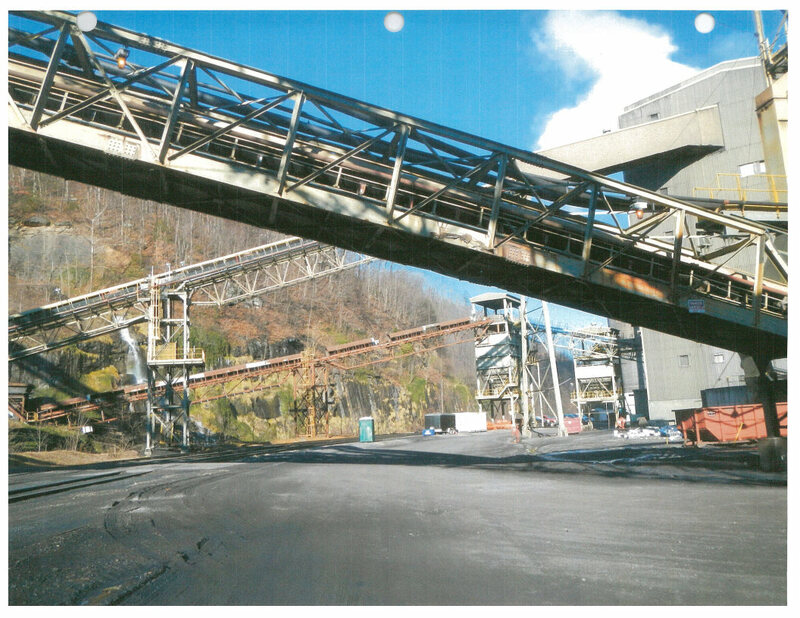 The inspection and structural reinforcing of the refuse conveyor at Coronado Coal LLC’s Buchanan Mine provides an example of how this can be accomplished in a safe, efficient and economical manner. The Buchanan Mine is located in western Virginia, just outside the town of Oakwood. The mine was originally built in the mid-1980s when it was owned and operated by Consolidation Coal Co. In 2016, the current owner, Coronado Global Resources, acquired the plant. 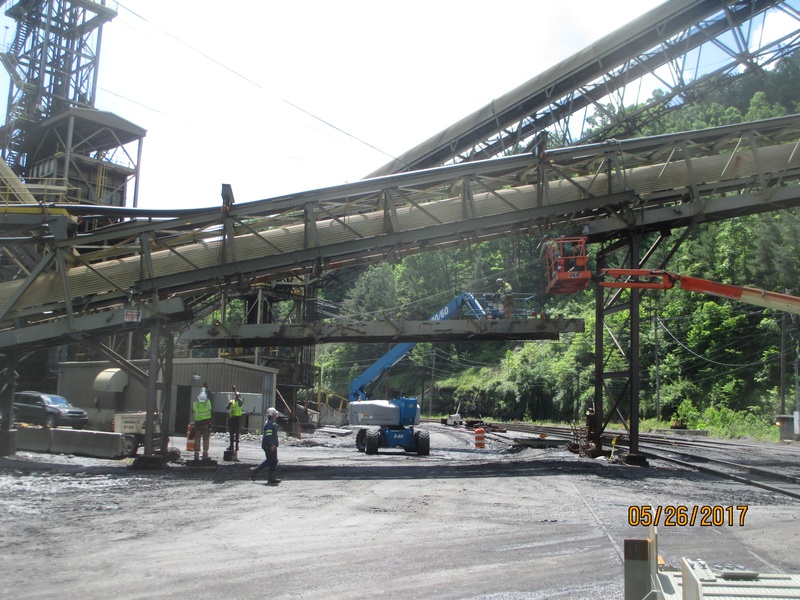 The 30-inch-wide refuse conveyor was installed when the plant was originally built, with some added upgrades over the years, and it extends about 2,500 feet (ft) from the preparation plant to a refuse bin. The first conveyor support truss is a 120-ft gallery that extends just above a main plant access road. The gallery has a checkered plate floor that acts as a spill guard where it crosses the road. The plant uses this conveyor as its only means of moving refuse material to its refuse stockpiles. In 2017, the Buchanan Mine contracted with Industrial Resources to perform a structural inspection and evaluation of this gallery truss and the two bents supporting it. 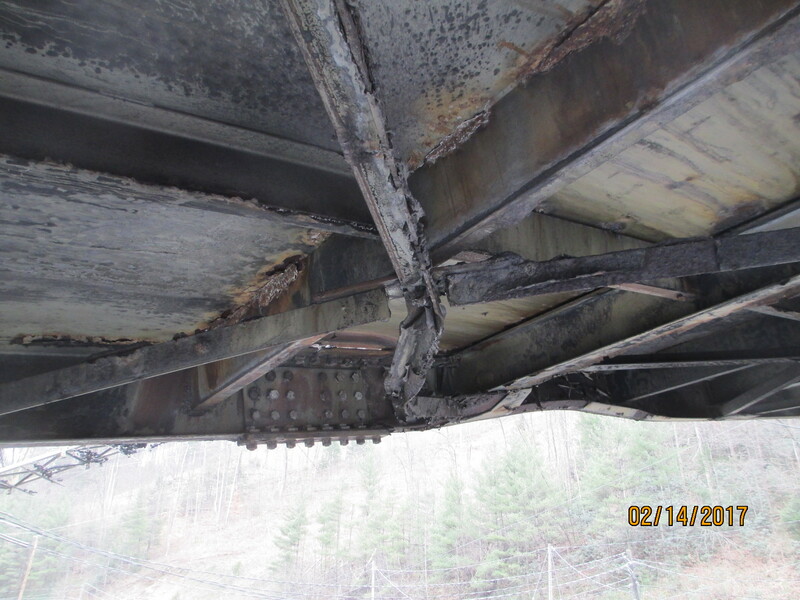 This truss was showing signs of deterioration, and over the years, it had also been impacted in several spots by traffic from the road below. Exposed to elements for years, the infrastructure had deteriorated. In addition to exposure, the supports had also been damaged. This evaluation identified structural deficiencies that had to be addressed for the long-term operation of the conveyor. In addition to minimizing conveyor downtime, other constraints had to be considered while developing a reinforcing plan that included the roadway below, the active railroad tracks that run parallel to the roadway, the two 12-in diameter overland refuse slurry lines that run along the top chord of the truss and maintaining the trusses’ camber that was built into the truss when it was originally fabricated 30 years ago. The project team, which included the Buchanan prep plant manager as well as engineers from Industrial Resources, developed and evaluated several conceptual plans. These included replacing the entire truss, replacing pieces of the truss one at a time, installing new supports around the truss, as well as a number of variations of these ideas. Industrial Resources is a turnkey bulk material handling contractor and has been delivering engineering, steel fabrication, construction and project management services to the mining industry for more than 70 years. The individuals from Industrial Resources on the project team included professionally licensed structural and mechanical engineers as well as an experienced construction team in safety, steel erection and scheduling. This level of skill and experience proved to be the key element in developing the best plan to successfully repair the conveyor safely and economically. Rather than evaluating each alternative from a limited perspective or separate group, the team was able to evaluate all aspects of the project at one time to select and present the best concept. Safety, engineering, constructability, impact to production, fabrication, scheduling and delivery issues were all considered as part of the decision-making process. The concept that proved to best meet the project requirements was to replace a roughly 40-ft section of the bottom chord, including both main bottom chord members and all the bottom chord horizontal bracing and struts. 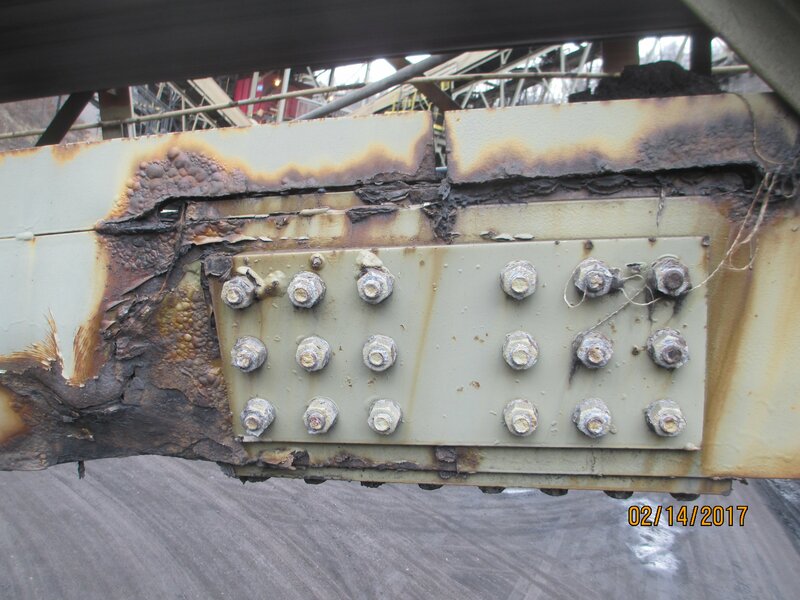 This section of replacement was in the middle of the truss, so care was needed to make sure the truss did not move once that amount of steel was removed from it. In addition, several vertical members along the sides of the truss needed to be replaced. The top chord was determined to be structurally adequate during the initial inspection. One solution was to provide temporary support along the sides of the truss that would not only keep all the vertical braces from moving — thus keeping the camber already built into the original design — but also act as a temporary bottom chord during the removal and replacement of the existing bottom chord. Once the sides of the truss were secured, the bottom of the truss was carefully lowered to the ground. A new bottom chord was then raised back up in its place. Because the temporary support kept all the verticals in place, the new bottom chord matched up perfectly with the existing. New splice plates were then installed to match the new to the existing bottom chord. After the bottom chord was in place, any remaining deficient members on the sides were replaced. A temporary support beam was installed, and the damaged truss was removed. The key to resolving these, and any other challenges, was ensuring that the correct people with the necessary experience were involved in the process. In addition to the structural design, the truss required detailed erection plans that could be executed safely. The designers needed to be as precise as the engineers and construction personnel to ensure success in making this happen. Within one month of performing the initial inspection and delivering the conceptual design, the project was under way. With the engineering, fabrication and construction departments all under one roof, the project moved ahead efficiently. Within 12 weeks from the initial inspection, the repairs were made, and the project was completed. The project was completed safely and in compliance with all regulations and did not impact the owner’s use of the refuse belt. The new truss was installed safely with minimal disruption to production activities. The completed project is ready for another 30 years. Reinforcing aging infrastructure can often be particularly challenging for many reasons. This project demonstrated the ability to successfully evaluate, repair and deliver necessary improvements without impacting service and will allow the structure to continue to function safely and effectively well into the future. 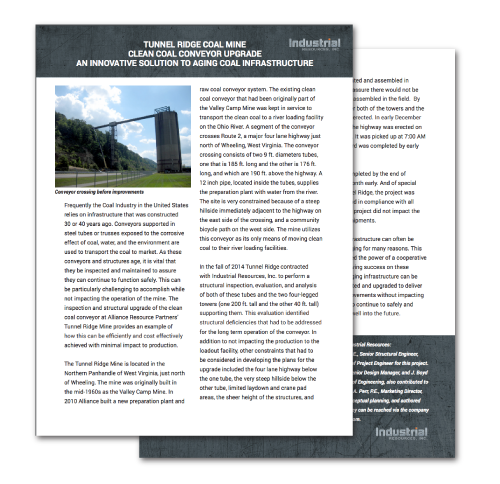 This article was submitted to Coal Age by Industrial Resources. Justin Leithauser is a senior structural engineer for Industrial Resources and performed the duties of project engineer for this project. Chuck Hillbery, assistant manager of engineering, and Boyd Rankin, manager of engineering, also contributed to this project. Delbert Davis and Terry Clark managed the construction aspect of the project. Frequently the Coal Industry in the United States relies on infrastructure that was constructed 30 or 40 years ago. Conveyors supported in steel tubes or trusses exposed to the corrosive effect of coal, water and the environment are used to transport the coal to market. As these conveyors and structures age, it is vital that they be inspected and maintained to assure they can continue to function safely. This can be particularly challenging to accomplish while not impacting the operation of the mine. 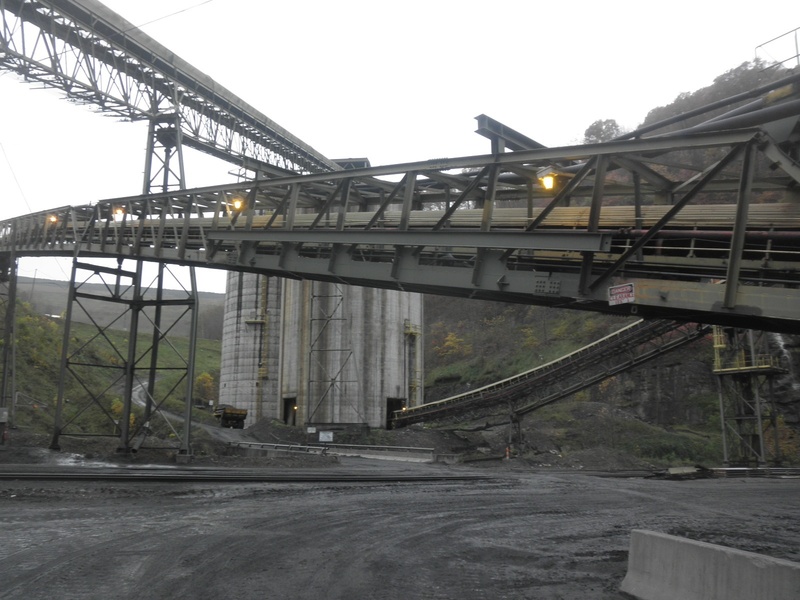 The inspection and structural upgrade of the clean coal conveyor at Alliance Resource Partners’ Tunnel Ridge Mine provides an example of how this can be efficiently and cost effectively achieved with minimal impact to production. Written by Justin Leithauser, Senior Structural Engineer, P.E.